As spring has fully come into its power and the fresh air is filled with the scent of flowers, we continue our series of fascinating interviews, presenting you the insights of a worldwide known e-Commerce expert - Ron Rule. A celebrated book author, he has revealed his personal success story and shared some useful tips for arising online shop owners. 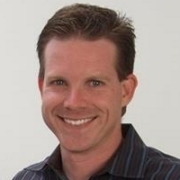 Ron, you’re a highly recognized e-Commerce writer and marketing specialist. Can you tell us a little bit about your life story? 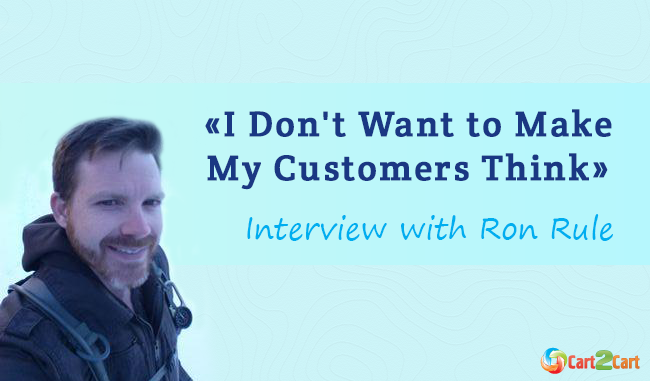 How did you end up being a customer engagement specialist? Most people tend to start on the marketing side and then pick up some technology skills as they go, I was the complete opposite - the nerdy kid in the 80's and early 90's who was tinkering with computers and learning how to program while everyone else was playing sports. I had a couple sales jobs in my late teens and early 20’s, going door to door selling ads and picking up some cool psychological tricks in doing that, but I was still always more comfortable programming and preferred to stay in my corner and just build stuff. Back in the days when Google results were easy to manipulate, I'd crank out microsites that would get search engine traffic all day long and lived on the ad revenue, never really giving much thought to UI/UX or e-Commerce from the consumer side of the business. Everything changed after I built my first shopping cart. Not really knowing much about what makes buyers take action, I had been hired to scratch-build a shopping cart for an infomercial production company - the infomercial world has some unique feature requirements that aren't available in traditional carts, like upsells that happen AFTER the checkout is completed that have to append to an already-completed order and re-authorize the card, or dealing with multiple suppliers and warehouses for the same products to fulfill from the closest warehouse to the buyer. There are a ton of carts that offer that sort of thing now, but back then it wasn't something you could get off the shelf. I ended up building them a complete cart with all the technical bells and whistles plus the features they needed and a user interface that made perfect sense (to me at least) for adding and managing products. So I'm sitting in the room with Kevin Harrington and his team, and he's basically telling me it's "functionally perfect but looks like crap". The team couldn't figure out how to use it, and it didn't offer the user experience they were looking for. It "worked", but it needed to look and behave differently to the consumer. And he starts rattling off all of these things about consumer behavior, what makes people buy, and it literally didn't make any sense to me – I thought it was fine, and they were a bunch of dinosaurs trying to employ old-school cold calling tactics on the web. So I pushed back a little, thinking that would never work and that I knew better, but ultimately ended up doing what I was hired to do and giving them what they wanted. The funny thing was, doing it "their way" not only converted better, but the AOV's were through the roof. I mean, here's a group of people that were peddling low-end $20 products on TV and getting $60-$100 average order values and 8% conversion rates on simple one-page sites consisting of little more than a hero shot, video, and order form. As a guy who always thought technical features were the most important thing, I was literally fascinated by the results of doing it the complete opposite way and taking a customer-first approach. It made me re-evaluate everything I thought I knew about the buying process, so I started experimenting. We didn't have buzzwords like "multivariate testing" or "audience segmentation" back then, but the sheer volume of traffic that was generated gave me the opportunity to test a lot of different things and have the results actually mean something. I would do simple stuff, like moving the logo from the left to the right, color changes, or changing a few words in a page so they sounded like they meant something different. My sales training started to kick in, and I found that just like with in-person conversation and body language, subtle variations on a website could have a major impact on the conversions. Ultimately I stayed with it; kept testing, kept improving, kept making notes. It's the strangest things that make people take action, and after a while you just develop the ability to look at a product and know how it needs to be presented to win. There's no magic formula that can be universally applied, but the more you test the more you learn, so each campaign gets progressively better. I took it all in, and ended up moving on and pursuing the e-Commerce angle as a consultant for other companies, but eventually found my way back to As Seen On TV years later as the CTO and head of e-Commerce. What do you think is more challenging - to run an online store or a physical business? And why? Definitely a physical store. My Dad was in retail management for many years, where their only trick of the trade was product positioning. Some of the big retailers would tag shopping carts with trackers so they could establish patterns of how people traverse through the store, and reposition products on the shelves and endcaps to maximize visibility for the best sellers, etc. In a lot of ways, it's the same thing we do with e-Commerce sites, but the difference is that I can literally summarize and analyze the data in seconds, and automate the changes. If I want products presented differently in an online store, an algorithm can figure out the best placement and put it there, and tailor that experience to each individual user. In a physical store, you don't have that luxury or level of personalization - you have to analyze the data by hand, then physically move stuff around to try to appeal to the majority. Testing products is also much more expensive in retail. Online, I can work out a dropship deal with a supplier and throw a few marketing dollars at it to see if it's something I want to take an inventory position on. In retail, you can't do that, so you're constantly guessing how much product you'll be able to move and have to spend real money just to give it a shot. Technology empowers us online guys to make better decisions, and in some cases the data can make the decisions for us by itself. You’re famous for writing books, articles and giving fascinating speeches on your subjects of expertise. How do you think, which personal qualities has helped you in gaining such an all-around success? There's really no such thing as an "expert" when it comes to e-Commerce - an "e-Commerce expert" is just the guy who's been fortunate enough to test the most stuff. ☺ Believe me, I have just as many stories where things were the complete opposite of what I expected, but that's the great thing about this market - you can adjust your trajectory in realtime. Every product, every site, every project is a blank slate. You'll have an idea of what’s likely to work based on past experiences, but if you're wrong it's easy to correct. I look at what the data is telling me isn't working and stop doing it, and I look at what the data tells me is working and do that instead. For that reason, I think my greatest personality quality is actually laziness. I don't want to think. I don't want to make my customers think. I don’t want to do anything. That's what computers are for. To win with e-Commerce, you don't have to rack your brain trying to think out every possible scenario yourself. You just have to know what questions to ask yourself, and be willing to put ego aside and act on what your data is telling you the answer is. Being an e-Commerce expert, you have probably dealt with a lot of various shopping carts. Thus, can you share some of you views on the subject with us? What platforms do you think are the best on the market, and which one is your personal favorite? 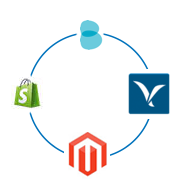 Personally I'm a huge fan of the hosted model - carts like BigCommerce, Volusion, Shopify, etc. I know all of the Magento guys will argue with me to the death on this, and to their credit, Magento is a great platform, but it's also best for guys like us who are already experts on the technology side of the business. If you understand what’s going on in the background and know how to configure it properly, you’ll be fine, but for most businesses I prefer the hosted model because they need to focus on running their business and not the technology that powers it. I've seen guys running WordPress carts that try to add a little customization and end up completely screwing up their sites when the next update or bug fix comes out. Having a hosted cart is like having a team of engineers working for you, making sure it's up and running, fast, etc. If it goes down, there are people standing by to fix it 24/7. If your self-hosted cart goes down, that's on you or people you're paying to figure it out and get it up, backed up, secured, etc. Even if you have the technical ability to manage it properly, it's a distraction from its intention - to sell product. It's worth the monthly fee for a hosted cart to not have to worry about it. And frankly, a service like yours is even more of a reason to go with a hosted cart, because you guys make it easier to migrate away if you want to change platforms or are successful enough to outgrow your current provider. Obviously, you’ve chosen a career path right, and you absolutely love your professional activity. But how do you keep such an enviable level of enthusiasm? How do you stay motivated to perform so many different tasks? There was a Forbes article I read back in 2011, about how Target's algorithm successfully predicted a teenage girl was pregnant, and what trimester she was in, based on the combination of products she was buying. Target caught some heat for it, and in the process of explaining how it happened they revealed how powerful big data really is. People don't really think much about how every action they take is used to promote products to them, but the smartest retailers in the world do - a lot of people are turned off by the notion of predictive marketing, but I find it fascinating. Who wouldn't want to be able to Jedi mind trick people into buying things? Technology improvements keep it interesting, so it’s easy to stay enthusiastic about it. Can you suggest some interesting authors and blogs for a person who’s just getting into the e-Commerce sphere? Is there any online journals that you read on the regular basis? Keep an eye on sites like PracticalEcommerce.com, Internet Retailer, and eCommerce Times. I follow all of them for different reasons - what's most interesting to me isn't the tips & tricks though, it's the case studies and reporting on what the big players in the space like Amazon and Walmart are doing. The tips and tricks are good for ideas, but don't make a decision for your site because it worked for someone else; different types of products and audiences convert differently. A lot of people, when they read an article about how some online retailer made a killing with Facebook ads, they want to pull all of their other marketing and go spend a fortune on Facebook ads, but you can't expect that your results will be the same. Especially with social marketing, some products just won’t have that appeal - if you're selling funny T-shirts you might do great, but if you're selling accounting software, do you really think people are going to get excited about that from a Facebook ad? Read articles every day, but pay the closest attention to what the big guys with products in multiple niches are doing, or the little guys with products similar to yours. If it’s working for them, split test it on your site and see if it works for you. We’re sincerely grateful to Ron for taking his time and providing us with a substantial amount of helpful information. Keep reading our blog as a plethora of expert’s insight’s are yet to come.